I was walking Poppy this morning, pj's on and parka zipped right up to my nose, when my brain got to thinking about the current creative fog that I find myself in and the possible ways that I could troubleshoot myself out of it. A few years ago, I shared advice on how to get out of a reading slump and, with my own current struggles in mind, I thought it was time that I shared tips on how to get out of a writing slump. These tips aren't one size fits all, sure, but there's hopefully something here to help you work your way out of whatever creative black hole that you find yourself in. I have spoken a few times about keeping a notebook for inspiration when writing, or when preparing to write, and I think during slumps is where the notebook really comes into its own. Think of it as a creative bible that you can consult in times of great need. Fill it with snippets of ideas or other people's ideas that you enjoy or simply just fill it with words that you might quite like to use in a future piece. Flip through the pages when you're feeling a creative drought and you'll hopefully find something to use. 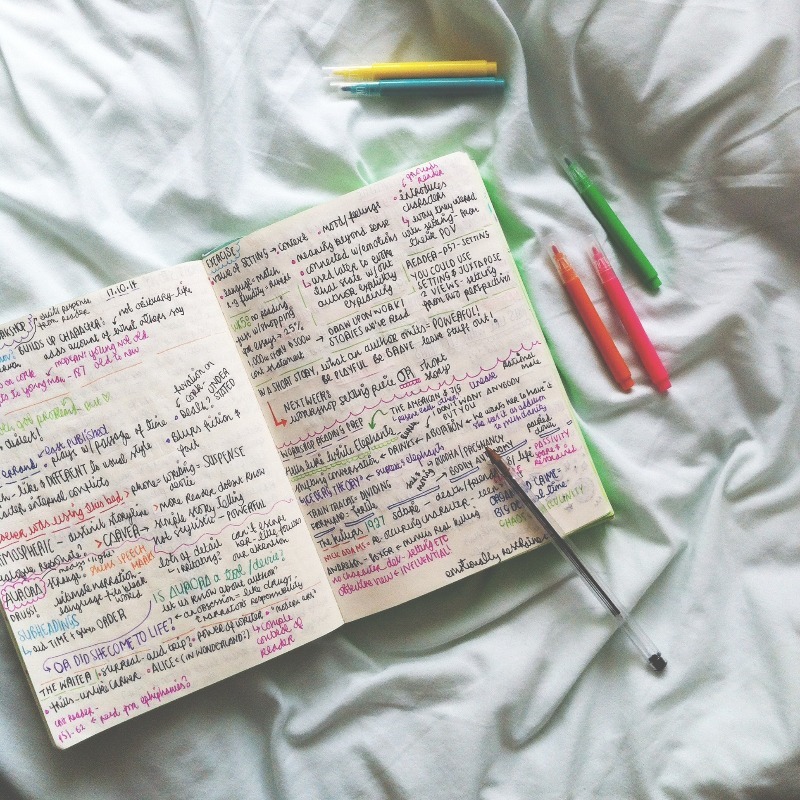 Allow yourself to keep a messy notebook and you may reap the rewards. Writing prompts can be an excellent way of exercising the creative part of your brain and, best of all, the results of these prompts don't even have to go anywhere. I have a whole host of word, sentence and image prompts on the blog if you're looking for some inspiration. Alternatively, you could write some book spine poetry or twitter fiction or some blackout poetry to get you in the mood. There are loads of fun writing exercises to warm you up. And, like I said, these exercises don't have to directly inspire your next piece of work. They can just be used to take creative thought for a walk. Take some inspiration from the idea of writing morning pages and jot down everything that comes into your head there and then, be it random slices of creative work or your next shopping list. This stuff doesn't have to be good or interesting or even relevant. It can be an exercise in putting pen to paper, or finger to key, again. Every project starts somewhere. Create a pin board, virtual or otherwise, for images or snippets of things that capture your imagination or match the vibes of your proposed piece. I have my own, albeit secret, Pinterest board where I pin images that I'd like to return to in the future. This is particularly useful if you're a visual learner. Read something. Watch something. Go for a walk*. Use this slump as time to gain inspiration from things. Don't just stick to your old faithfuls either. Switch it up and you may be amazed by the results. Whilst you're doing these other things, and consuming different types of media or content, pull them apart and work out what draws you to them. Consult my post on how to annotate books for more info! *If you choose to go for a walk, why not record yourself as you wander about?! Whenever I clean my bookshelves, I set up the voice recorder on my phone and chat ideas into existence. The quieter moments can often be the most lucrative for productive thought. Listen back and see if anything is of substance. Use the non-writing time as research time. Head to the library. Scroll through Google. Dig deeper if you have an existing idea that needs more flesh. Or, alternatively, search out a topic that's of interest to you if you haven't a clue what you're intending to write about next. Profile an element of your project through scribbled notes. By honing in on one aspect of your piece, your brain isn't going to feel too overwhelmed and will instead compute things in stages. Write a gingerbread character study a la Year 11 drama class or scribble a list of places of interest with regards to the setting of your piece. Creative ideas aren't born polished so it's okay if they're developed via scribbles on scrap paper. Create building blocks for your creativity to cling to. If you have a sliver of something, be it a title or a paragraph or a passing idea for something, why not share what you do have with a friend? Ask them to workshop it for you and provide feedback. Their comments may give you another burst of energy to go forward with. As I said in my tips for studying a creative writing degree post, workshopping can be hugely useful even though it seems incredibly daunting. It can often change the face of a project so it's so worth doing. Start a Wreck This Journal, go for a photo walk, do a spot of painting or lose an hour or so to gardening. Play around. Use your hands. Let the embers rise into an idea for something written. Do other things for a while. Come back with what you now know. Accept that sometimes your brain is actively telling you to take a backseat. Rest. Come back in minutes, hours, days, weeks, with a new head. Hopefully you're now clued up on how to get out of a writing slump. It's never easy when your creative brain just doesn't want to co-operate so go easy on yourself. Get some rest, take care and then come back to it. It's okay to take breaks and it's okay to need them too. If you're looking for more advice or more creative posts, you're in the right place as there's plenty in the Vivatramp archive. I remember taking part in an exercise at university that involved walking around the classroom whilst writing, as it's meant to help your thoughts flow. I hadn't thought about setting up a recorder whilst I mill about, but as seeing as I find myself talking to myself more often than I care to admit, it's probably a productive way to go! Resting is also such a good point, too. I notice I'll continue to chip away at ideas, when there's nothing left to chip away at - taking a back seat can sometimes be the best thing for it!